The costs and consequences of Greece exiting the Eurozone may well dwarf the financial losses triggered by Greece's default. The term Jingle mail originated in the great popping of the housing bubble 2008-2011. It refers to defaulting homeowners mailing the keys to their house back to the lender, and it denotes the finality of default: it's over. The dream of ownership and easy wealth leveraged by vast debt: over. The dream that loans to marginal borrowers were as good as loans issued to qualified buyers: over. And most importantly, the lender's dream that marginal borrowers could somehow make the payments if the terms were tweaked is also over. 1. Accept the reality of default, write off the loans and accept the horrendous losses. 2. Play for time by renegotiating the loan, reducing the payments, stretching the payments over a longer period, etc. 3. Bury the non-performing loan as zombie debt: the loan disappears from the performing loans but isn't listed as a non-performing loan, either. It has become a zombie loan, neither performing nor non-performing. So the lender strings the debtor along, squeezing enough interest out to justify the claim that the loan is performing and the asset (i.e. the loan) is still worth its listed value. The European leadership has done a grand job of stringing Greece along to maintain the illusion that default is not inevitable and final. This stringing the debtor along has yielded impressive returns for Greece's lenders, at considerable cost to non-Oligarch/non-vested-interests Greeks. Note how little of the Greek "bailout" actually went to the citizenry of Greece and how much was interest paid to Europe's financial powers. 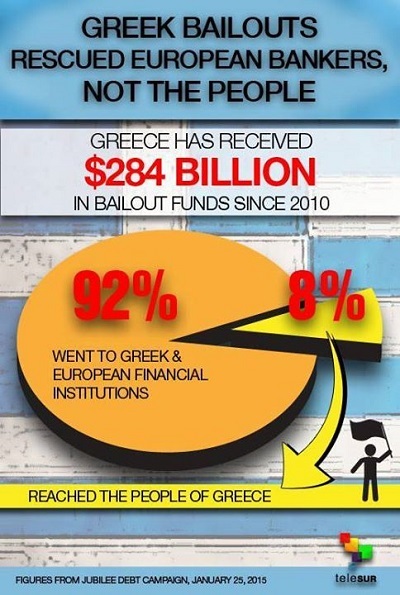 The loans to Greece benefited both Europe's financial Aristocracy and Greece's oligarchies/ kleptocracies. This is ably demonstrated in the recent essay Misrule of the Few: How the Oligarchs Ruined Greece. Although much has been written about the Troika (the International Monetary Fund--IMF, the European Central Bank--ECB, and the Eurozone), this chart reveals that the IMF and the ECB have relatively little skin in the game. If Greece defaults on all its debts, neither the IMF nor the ECB will be dealt a crippling blow. The Eurozone's constituent nations will not be so fortunate: they are on the hook for most of Greece's loans. Should the loans be written off, the losses will go directly to the nations that ponied up the bailouts and other funds. Let's turn to why mortgage lenders have let tens of thousands of defaulted homeowners continue to live rent-free in their jingle-mail homes. If the lender starts liquidation proceedings, the loan immediately becomes non-performing, and the fantasy that the lender will receive the full principle and interest will shatter. So it's actually cheaper, in terms of consequences, to let the defaulted borrower continue to live in the home for free. This monthly loss is far more bearable than the enormous loss that must be accepted should the lender start foreclosure proceedings and write the mortgage off. The Eurozone may well decide that Greece does not have to exit the EU, for analogous reasons. If Greece defaults and exits the Eurozone, the entire Eurozone project is at risk. What's to stop the other member nations groaning under unpayable debt from defaulting? The costs and consequences of Greece exiting the Eurozone may well dwarf the financial losses triggered by Greece's default. Once Greece puts an end to the fantasy that all the principal and interest will be paid in full at some distant point, Greece's lenders will be forced to jettison the public-relations illusion that tweaking the terms made everyone whole. That will leave them with only two options: either accept the losses incurred by Greece's default, or shove Greece's debt into the zombie column--neither performing nor non-performing. What's the PR cover for this zombie status? "Negotiations are continuing." Meanwhile, the government of Greece will no longer be able to borrow more money. It will only be able to spend whatever cash it collects. The dream of living beyond one's means will end. The people of Greece, meanwhile, will continue using euros and remain in the Eurozone. What's not to like? Greece doesn't have to exit the Eurozone, nobody has to pony up more money for a lost cause, and the write-off of debt that will never be paid is set aside in the highly convenient zombie debt status. Yes, Greece still owes all that principal and interest, and no, it's no longer making payments, but negotiations are continuing and officials will indefinitely remain close to reaching a deal to squeeze blood from a stone. Thank you, John V. ($100), for your outrageously generous contribution to this site-- I am greatly honored by your steadfast support and readership.